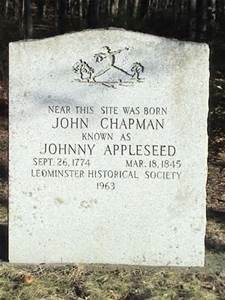 He was born John Chapman on September 26, 1774, but he became a folk hero who was called "Johnny Appleseed." Chapman grew up in Longmeadow, Massachusetts, the son of a farmer. During his teens, he apprenticed as an orchardist and nurseryman, thus beginning his life-long interest in apple orchards. 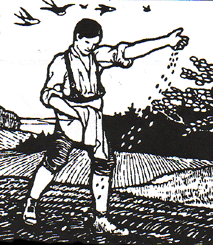 While the legend has Chapman spreading apple seeds on the ground as he walked, he actually planted nurseries. 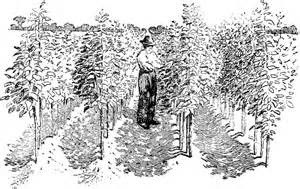 He would fence the trees and leave a local farmer in charge of tending them, coming back every couple of years to check on them. 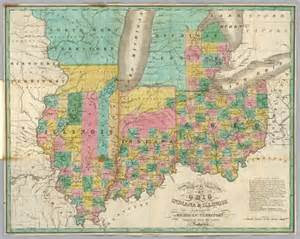 Chapman’s first nursery was planted south of Warren, Pennsylvania. At the beginning of the 19th century, he moved west into Ohio, taking with him apple seeds he had gathered from cider presses throughout Pennsylvania. Chapman traveled throughout Ontario, Pennsylvania, Ohio, Indiana and Illinois, for more than 40 years, planting orchards and selling apple trees. He also took time to educate local farmers on how to plant nurseries, and how to tend the orchards. Chapman was also a member of the Church of New Jerusalem, a pacifist sect that believed in simple living. He preached that God and nature were entwined. It was said that he dressed in sacks he had fashioned into clothing, and wore a metal pot as a hat, which he could also use for cooking. 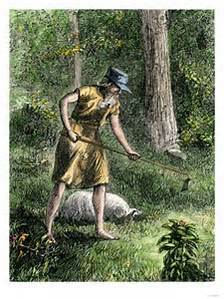 Chapman advocated that animals should be respected, and was one of the first known vegetarians. Native Americans believed that the Great Spirit guided Chapman, and he was welcomed into many tee pees to share his knowledge, and preach his Gospel. The legend of "Johnny Appleseed" came about when W.D. 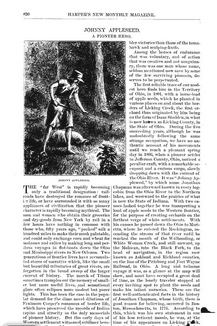 Haley wrote in colorful prose about Chapman’s life, spreading apple seeds across Ohio for “Harper’s Weekly” in 1871. John Chapman died of pneumonia on March 18, 1845 – 171 years ago, at the home of a friend. On his death, “Johnny Appleseed” left over 1,200 acres of nurseries to his sister, including 15,000 trees located in Allen County, Indiana. 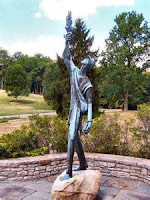 John Chapman aka “Johnny Appleseed” was buried near Fort Wayne, Indiana, but numerous markers and monuments have been erected throughout the Midwest in celebration of the man, and his life’s work.